Create a grid that is approximately 20X20 (or larger depending on the number of players involved). Each player should have a ball and position them inside the grid. Instruct the players to tag (touch) other players within the grid. 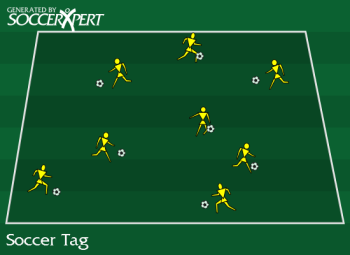 Once the player gets tagged, they must hold that area of the body that was touched while still dribbling while avoiding other tags and attempting to tag others. If players are tagged a 2nd time, they must hold both touched areas while dribbling. If the player is tagged a 3rd time, the player must move to the outside of the grid and perform an exercise such as 25 toe touches, four juggles, 25 foundation touches, or push-ups before rejoining the game. Keeping the ball close to the player. Head up where they can see ball and players. Use all parts of the foot while dribbling (inside, outside, bottom, heal, top). Be agile and attempt to move away from the tag.